Atari released these five new images from the Xbox 360 version of Alone In The Dark, as always looking quite good technically. i was actually getting quite interested about this game, but then gametrailers released some footage of combat and my anticipation went down the drain, combat looks slow and boring, and the AI is about as retarded as it comes. other then that major gameplay element, it looks great. but physics and cool fire isnt going to save this one imo. The GT videos did look very clunky, but my excitement isn't totally gone. They still have time to fix that stuff. Also the audio in the GT videos was HORRIBLE, I thought they just played music over the video, but then I heard some of the sound effects. 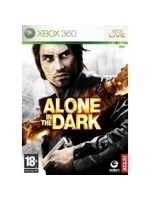 besides Alone in the Dark has never been about combat! it's Puzzles man Puzzles that count and the videos we've seen of the stuff we can do are amazing! I never bought Alone in the Dark for the combat not Silent hill for that matter. you buy these games for the atmosphere, story and puzzles! what i find funny is that the title of the video is "exclusive, action packed gamplay"
Yeah, the combat looks really crappy :/ but they still have time to fix it. Yeah. You would think that was a given. But w/e. Its a technical play house. Metal deformation, amazing fire systems, an original inventory mechanic, and unconventional combat, not using your typical weapons but like the blood pacs and the lighter and stuff and combinations of what you have. And I think the combat looks ok, if they were to make it so you can swing in any direction and stuff it would be great. The ps3 is not a port apparently, its being designed to specifically use the architecture of the ps3, hence the delay. And exactly what is it about the architecture that would cause such a delay if it's being designed specifically for the PS3 instead of being just another port? I'm not buying the whole ' porting from the Xbox360 to PS3 is difficult because of the different architectures'. From my understanding, this was not the first generation of videogaming that developers designed a game for multiplatforms which had different architectures ( PC, Xbox, PS2, Gamecube). The PS2 was difficult to develop for, but it didn't create the fuss of this generation as much. If it's so different; how the hell does it play PS2 games which were developed on far different hardware? It's just a question. It's not like the main character is a super stealthy ninja with elemental powers or a white haired devil slayer with a gigantic sword. I think that's what they're trying to convey, although the person playing it wasn't too good at showing off the game. i never expected that to be the case, but currently it looks unresponsive and clunky...and that had nothing to do with who's playing, its to do with the fact the combat is broken (at least for now) and the AI is some of the worst i've seen in a current gen game. i mean, what are the enemies doing 90% of the time? its like they just stand there so they can get stabbed in the neck. it needs fixing or there is no hope. i know im glad i am not the only one who noticed this. it seems that everyone on the gametrailers site all said "AWESOME" or "COOL" and "PERFECT!" to it. this was far from it. the audio sounded so bad. the gun sounds like it came straight out of a Stephen Segal flick. and the explosions...wtf?! i wasn't aware that explosions sounded like farts in the wind. this game needs to fix the audio big time if it even wants to think about being any scary at all. seems like the movie link to gametrailers is broken. They took it down? This gen the hardware for each console is vastly different. 360 is basically the bread and butter as MS designed it be as user-friendly with developers as possible. In some ways it's extremely similar to developing a game for PC. PS3 on the other hand is extremely complex with this Cell processor, which isn;t really designed for gaming. They way the RAM is distributed in PS3 is also vastly different to 360's. 4. Create the game on 360 and port over to PS3, with the result being a crappy port. As for how PS3 plays PS2 games, they run on emulation software, just like Xbox games do on 360. KORNdog: Gamersyde's own unpaid critic.